I'm rockin' the Crafternoons these days. After my four Xmas Crafternoons, I'm taking a mini breather. I did have a craft date with 25 ten year olds on Friday though. It was through a friend. Her daughter goes to Ross Road Elementary and is part of the Environment Club there. I dropped by for a lunch craft session. We made fridge magnets, jewelry and pins out of repurposed junk. It was a blast! Next I'm having a 'Craftinner' with friends on Tuesday night - potluck dinner and crafting. YAY! Otherwise I'm planning Crafternoons for 2014. 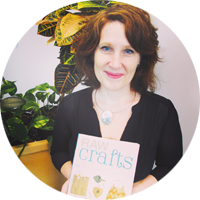 I'm having a Chinese New Year Crafternoon at the North Vancouver City Library on January 25th from 1:30pm to 3pm. I'll also be having another Crafternoon at one of the Habitat for Humanity ReStores in either February or March. 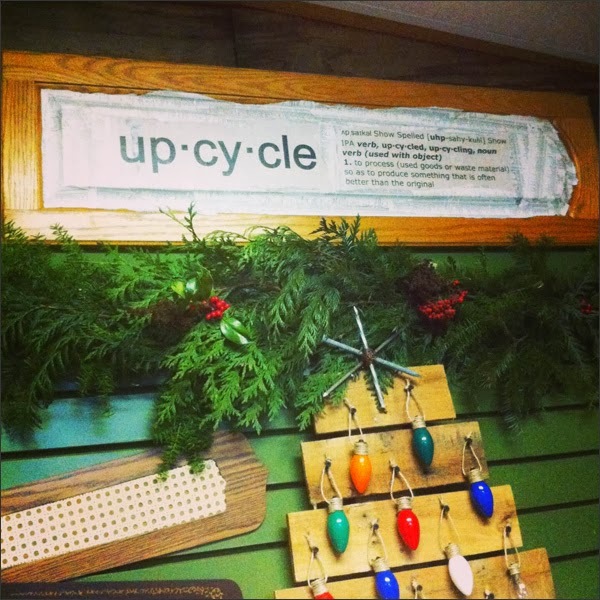 Other TBD news includes an interview with the North Shore News about holiday upcycling. That should be out soon enough! I'll post the link once it's published. 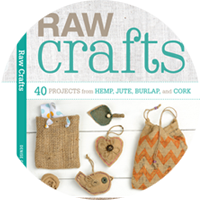 And I've received some super lovely feedback about my Crafternoons. Feeling very loved these days. So I'm sharing the love! This weekend I'm finishing up more Xmas ornaments out of old wool sweaters and making junk jewelry to send off as thanks to a few kewl peeps. I was going to keep these guys but I'm mailing them off to new homes on Monday. 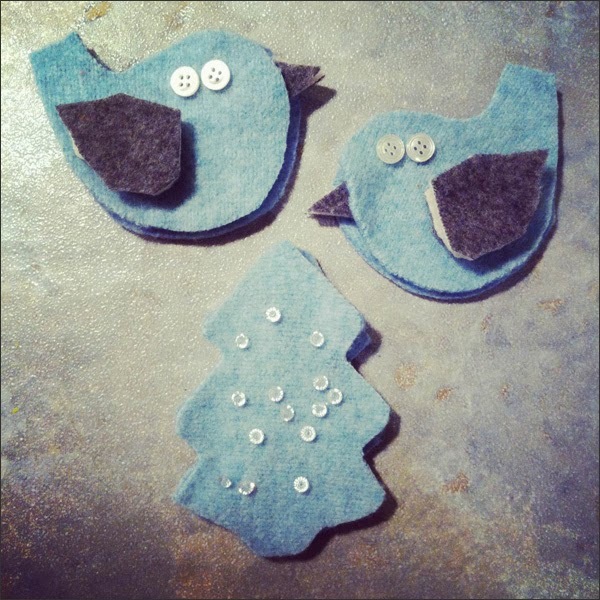 I'm making a couple of more bird ornaments and a tree ornament. 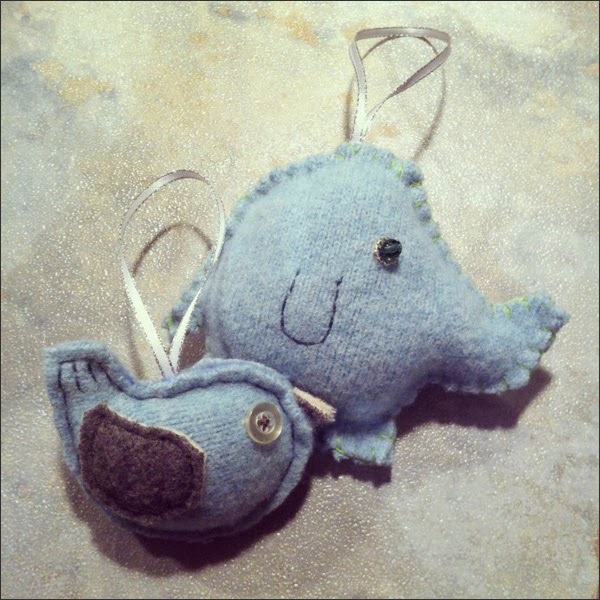 Love hand stitching funky stuffies! This week I met up with my new upcycling peep Inis at Squamish Rebuild. She's been super crafty lately. 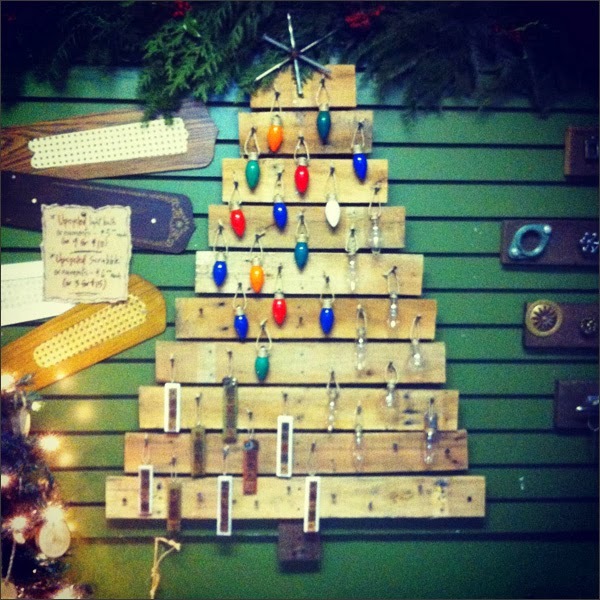 She's made some nifty ornaments out of old light bulbs, scrap wood, Scrabble pieces, etc. Very inspiring! This aft I'm getting crafty then heading to the Sunshine Coast for a fun night with friends. Hope everyone is getting into the Xmas spirit!